Are you looking for guided audio meditation? Your heart has guided you well. Here are 8 Weeks of Inspiring Heart Meditations. These meditations are based on the ancient practice of Heart Rhythm Meditation, the BEST meditation practice for your heart! Do you have blockages and emotional pain or heartache that never seems to heal? Would you like to be in rhythm with life’s conditions and in tune with a greater reality? Would you like to bathe in a pool of pure emotional energy as you slide into stillness and deep relaxation of the heart? This Online Audio Meditation Program will heal your heart physically, emotionally, and spiritually. Discover how to energize your heart, eliminate emotional blockages and inspire your life! Most people think their minds will solve their problems and guide them in life. But that is not really the most effective way to live. Life lived only from the mind is tiring and draining. You need to be able to energize your real power center which is your heart. When you energize your heart, all things become possible. Your heart is the central rhythmic force in your body. Discover how to bring it into what scientists call Coherence. Coherence is a state of balance between your heart, mind and emotions. We also call this Harmony. Or we can call it the Zone of Performance. It is the state you want to be in as often as possible. 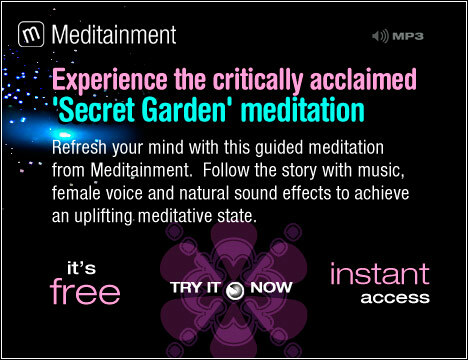 For Mental Clarity, try this free 20 minute guided meditation from Meditainment. Take some time for yourself and go to your secret garden. Open your mind and heart while you breathe peacefully while resting in your secret place. Now you will be ready to contemplate anything you choose.